Potatoes are high in fiber, with some types giving you close to 3 grams in each serving. The perk of fiber from potatoes is that it comes in both forms, soluble and insoluble, although the insoluble content is higher. Each type of fiber has specific benefits for your body, but you'll have to leave the skin on to get the full effect. The exact amount of total fiber you'll get from your tater depends on which type you prefer. Sweet potatoes tend to offer the most. Three ounces of sweet potato with the skin, about half of a large one, offers approximately 2.8 grams of fiber. Russets aren't too far behind, with 2 grams of fiber for the same serving size. Red-skin potatoes have a bit less fiber. Usually a 3-ounce red-skin spud offers roughly 1.5 grams of fiber. 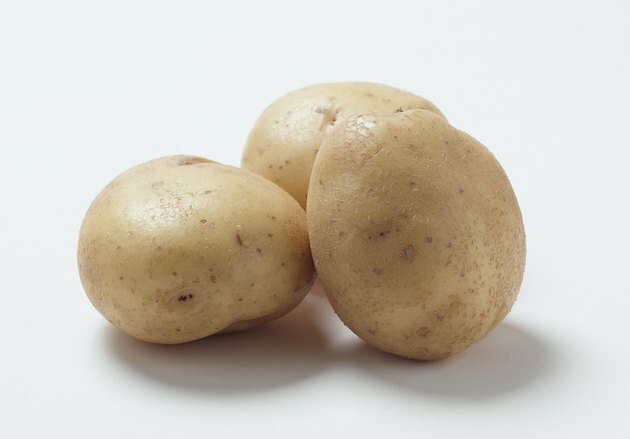 Much of the insoluble fiber in potatoes comes from the skin, so don't peel it away. Insoluble fiber pushes through your gut, forcing out waste to help you have bowel movements on a routine basis. Regularity is important for reducing your risk of hemorrhoids, as well as for minimizing your chances of suffering from painful inflammation from diverticular disease. Soluble fiber, which comes mainly from the flesh of potatoes, soaks up fluid in your intestines, creating a gel-like material. As a result, digestion slows down, giving vitamins and minerals time to absorb through intestinal walls. Plus, as the substance travels through, it picks up low-density lipoprotein, or LDL. This is the type of cholesterol that clogs your arteries, so if you have more soluble fiber, there's the potential that it can reduce problems with high cholesterol. It can even slow down sugar absorption, resulting in more stable blood glucose levels. Your fiber needs vary depending on gender, stage of life and calorie intake. Typically, though, men need 30 to 38 grams a day, while women require 21 to 25 grams a day, according to the Food and Nutrition Board of the Institute of Medicine. Women need a bit more during pregnancy and while nursing -- 28 to 29 grams each day. These are just general recommendations, however, and your needs might be different. You can also calculate how many grams you need for your specific diet, as long as you know how many calories you have on average. For every 1,000 calories, you should aim for 14 grams of fiber, as stated in the Dietary Guidelines for Americans 2010. On a 1,600-calorie diet, for example, you should get 22.5 grams of total fiber every day, while on a 2,500-calorie diet you'll have to get 35 grams.